Good quality extracts can make such a difference in cooking! Baking sugar cookies? Vanilla is wonderful, but add some almond extract and now you really have a special treat. Or a touch of orange extract in the frosting on a chocolate cake. Oh, my! Pure extracts can be pricey, but you can easily make them at home for much less. Package them in attractive jars, and you have a unique item for gift giving. Below are 6 simple recipes to get you started. All of them use vodka. I prefer a brand that is GMO-free – I used Absolut brand for my extracts. It’s made from deep well water and winter wheat grown in Sweden (where GMOs are not allowed). When I was last in the liquor store I also spotted some organic brands of vodka. Combine the vanilla beans and vodka. Cover and store in a dark area for 3 – 6 months, shaking occasionally. Remove the beans if desired, and bottle in an attractive jar for gift giving. Combine the mint leaves and vodka. Cover and store in a dark area for 1 – 2 months, shaking occasionally. Remove the mint leaves by straining, and bottle in an attractive jar for gift giving. Combine almonds and vodka. Cover and store in a dark area for 2 – 3 months, shaking occasionally. Remove the almonds by straining, and bottle in an attractive jar for gift giving. peel of 5 – 6 oranges, lemons, or lime (use the higher amount for the smaller fruits) with the pith removed. The easiest way to do this is to peel the fruit with a vegetable peeler. Combine the citrus peel and vodka. Cover and store in a dark area for 1 – 2 months, shaking occasionally. Remove the peels by straining, and bottle in an attractive jar for gift giving. Combine the raw cacao nibs and vodka. Cover and store in a dark area for 1 – 2 months, shaking occasionally. Remove the cacao nibs by straining, and bottle in an attractive jar for gift giving. Combine the coffee beans and vodka. Cover and store in a dark area for 1 – 2 months, shaking occasionally. Remove the coffee beans by straining, and bottle in an attractive jar for gift giving. Use in any chocolate dessert; it will enhance the flavor. What extracts have you made? How have you used them? I hope you try some of the other flavors, too! Thanks for stopping by, Mrs. D! You know what’s best for your own household, I’m sure! For a while my daughter used homemade vanilla extract as perfume. That reminded me of when I was a teen and Love’s Fresh Lemon spray was the rage. When my bottle of Love’s Fresh Lemon ran out I remember making my own with lemon rind and rubbing alcohol. 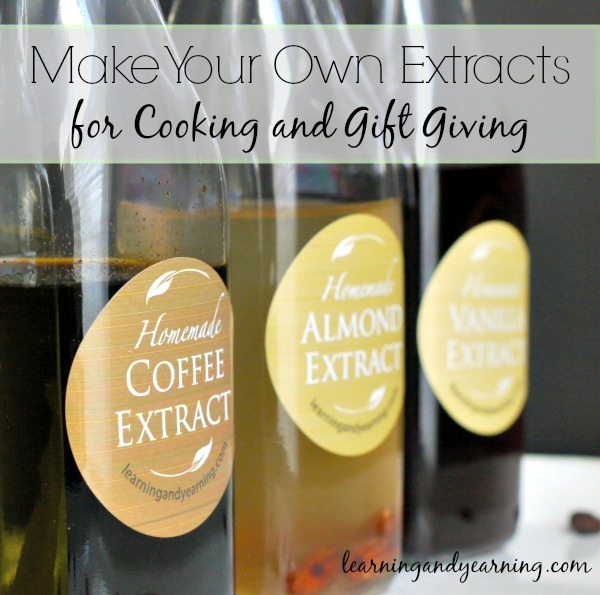 I never thought of making my own almond extract. That’s a great idea for Christmas gifts! Kristel, what a fantastic idea! I love it, and plan to try it. Hi Liz, As long as the extracts are stored in a cool, dark place, they should last indefinitely. How much does each extract produce? I love the idea of the lime! Hi Donna, Each recipe produces about a cup of extract. I just wonder, will doubling or tripling the recipes work as well? So you can combine the ingredients in a larger jar while it sits for several months and then you can put it in nicer bottles when you go to give it for a gift. Just wasn’t sure if it would take double or triple the time to be ready if you combine it all together. Do you know by chance? Hi Jessica! Yes, you may double or tripe the recipes without any problem. It shouldn’t increase the time at all. Love making extracts. Love to make them and add them to herbal medicine concoctions to make them taste better! There will be a line up for these gifts! Was wondering what kind of alcohol is used in store bought extracts ? Can it be that much different than vodka. Hi Annie, I really don’t know what they use, but I believe you are correct. It is likely similar to vodka. I was wondering if you had a recipe for butterscotch extract. I would like to try to attain the flavor in my cookies without using actual chips. Hi Jean, no I’m sorry, I’ve never made butterscotch extract. Have you tried googling homemade butterscotch? Has anyone tried making ginger extract? I haven’t but that sounds wonderful, Tracy! 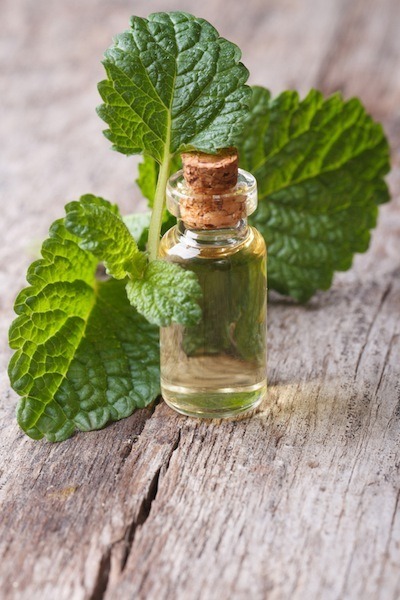 Have you ever made spearmint extract ? If so what recipes would you use it in? I ask because I currently have spearmint growing and thought it might be a good starting point for me. Hi Nancy! You would make spearmint extract exactly as I’ve described for mint extract, and would use it in the same types of recipes. Thanks so much for stopping by! Hi Leslie, no, I’m not familiar with butter extract; I wouldn’t have any idea how to make it! I can’t wait to make them. I bought almond extract and it evaporated. No problems with this? I haven’t had any problems with evaporation. I do use a jar with a tight fitting lid. I’d like to make an apple extract and a corn extract. I don’t know if I’d need whole apples or peels. Any ideas for making these? On a low carb diet apples and corn are not allowed but there are great faux recipes with the right flavorings. The problem is these flavors are expensive! Hi Michaele, I’m not familiar with either of these extracts, so I’m afraid I have no advice for making them. I hope you can figure it out! You could play with the recipe and make something akin to baked apples that will likely fit your diet for when you’re craving apples. I have a question. How long with these extracts keep on the shelf. I would like to let the people know that I give them to as gifts since I think it’s a question they will ask. Hi Terri, because of the vodka, the extract will keep indefinitely. Enjoy! Hi! I am trying the almond extract. I used the vodka you suggested. After 2months in a dark cabinet , it still smells more like alcohol than almond . Should I change out the almonds? Any other suggestions? Yes, Sharon, that should help. You could also try coarsely chopping them.